In a rapidly changing world, there has never been a more crucial time to supplement to maintain your health. Our air is polluted, food contaminated and lives more stressful. We’re living longer, but definitely not healthier lives. Taking a supplement to optimize your health might be the right step. NATROGIX products are manufactured in the USA, in a strictly regulated GMP facility. Where possible, they’re also tested under rigorous conditions by third-party laboratories. All formulas are 100% natural, sourced from natural plants and compounds found in their original environment, free from pollution and heavy metals. Natrogix BIOTIN has highest potency, delivering a powerful 10000 mcg in each serving. Supports Hair Growth, Glowing Skin and Strong Nails, giving a youthful glow and leave you feeling rejuvenated. This high potency and first-class Hair loss supplement works great for Women, Men and Seniors. 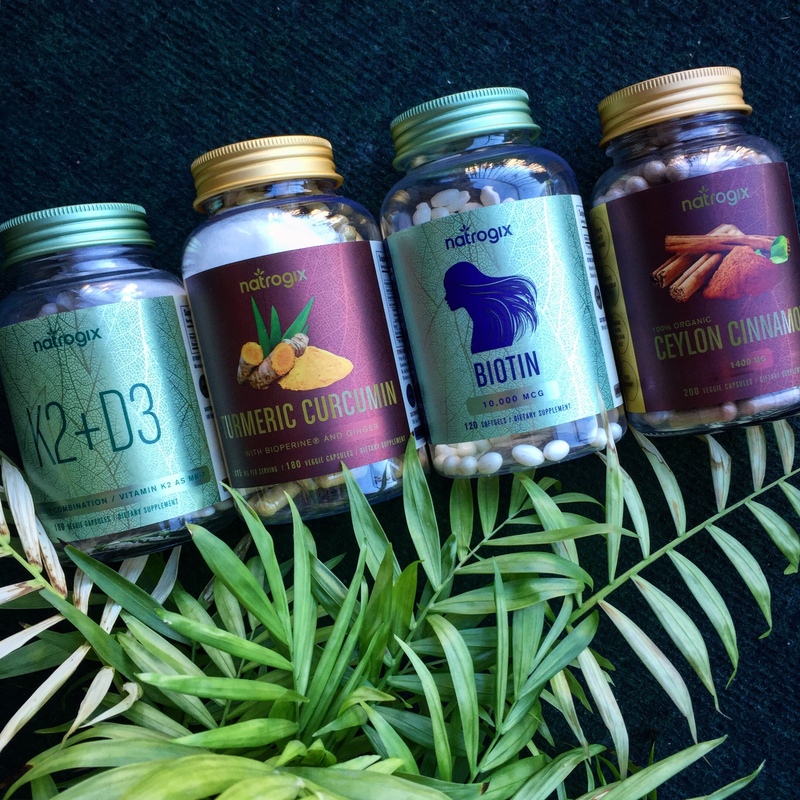 Natrogix Biotin for hair growth catalyzes key reactions that help to naturally support and stimulate the body’s metabolism. So you can not only rid yourself of harmful toxins, but also get natural beauty from within. Natrogix TUMERIC CURCUMIN 2415mg of Turmeric Curcumin with 95% Standardized Curcuminoids per serving (Highest Potency) and 15mg of BioPerine® (black pepper fruit extract) and 150mg Ginger. This high quality and professional grade product works great for each body in need. NATROGIX TURMERIC CURCUMIN WITH BIOPERINE® – Natrogix Turmeric Curcumin helps relieve joint & back pain, reduce skin dryness, boost brain function & memory, improve digestion, enhance immune and nervous system. Numerous clinical trials have proven that BioPerine® extracted from black pepper is the only herbal nutrient to increase the absorption of supplements and nutritionally healthy compounds. Ginger, a powerful natural painkiller, has been a popular spice and herbal medicine for thousands of years and has been shown to boost bone health and relieve joint pain. Natrogix K2+D3 is formulated by professionals with 5000IU of Vitamin D3 with 120mcg Vitamin K2 per serving. This high quality and professional grade product works great for each body in need.Vitamin K2 has an important role in the process of bone mineralisation. Vitamin K2 activates osteocalcin, a protein in bone cells. Osteocalcin helps bone cells bind calcium to the bones assisting bone formation, strength and repair. Naturally derived vitamin D3 is included to help in the development and maintenance of healthy strong bones and to help the absorption and utilisation of calcium from the diet. If you’ve heard “hardening of the arteries”, it’s referring to calcification. Calcification occurs when calcium has been absorbed by the body, but deposited in arteries instead of bones. This formula not only helps support the proper absorption of calcium with D3, but the correct distribution to your bones where you need it most.If you take Vitamin K2, we strongly recommend you take Vitamin D3 with it together. K2 is a “traffic cop” Vitamin which puts it in the right places always (bones), and D3 can help the absorption of calcium. Vitamin D3 is the calcium side, K2 is the calcium directing side. Vitamin K2 and D3 can increase the accumulation of osteocalcin in bone cells, much more efficient than either of the two nutrients alone. Natrogix CEYLON CINNAMON delivers the most superior form of cinnamomum verum on the market. Contains 200 vegetarian capsules for a full 100 day supply. Each serving of 2 capsules provides 1400mg of ceylon cinnamon. A powerful natural antioxidant, Ceylon Cinnamon improves cardiovascular health by promoting lower blood pressure and the balance of ‘good’ to ‘bad’ cholesterol levels in the body. It also helps to stabilize blood sugar levels and enhance metabolic rate, increasing fat loss and promoting a healthy body composition. Does not contain any artificial flavorings or synthetic ingredients. No aftertaste, and only the purest Cinnamon sourced from Sri Lanka.